Engineered to adapt to all the ways - and the places you work. Quickly converts to a flat-top or a box-top cart with one hand. Hinged side gates on both shelves flip up or down for different cart configurations - no tools necessary. Flat-top for sliding boxes on and off shelves and box-top to secure cartons during transport. Made of high-density polyethylene structural foam - panels are dent-resistant, and rust-proof. Innovative I-beam design allows for easy loading and unloading of oversized boxes on the lower shelf. Rounded corners and edges prevent mishaps. Handles loads up to 400 lbs. Features supply compartments for easy access to small items. Comfortable full-width handle. Easy rolling on durable, non-marking 5" ball bearing wheels - includes rear locking casters. Available in Gray. FOB Shipping Point. 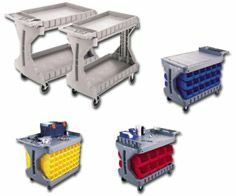 Order rail system and bins to add maximum organization capacity to the ProCartâ¢. Keeps small items ready for instant retrieval. 9 Rail System combined with Rugged Hanging Bins for a complete system. Bins available in Red, Blue, Yellow or Beige - please specify. Product No. Description Size L x W x H Wt. (lbs.) Price Ea.